Yes, most of what has made it up onto this chronicle lately has been about our garden. We have been doing lots of other work, to be shared soon. For now, here is a strange story about the mystery weed that came up in our vegetable garden. Having never planted jerusalem artichokes before, I had no idea what they would look like when they germinated. I’d seen these lovely big plants with their small yellow sunflowery blossoms, but never the young seedling. The first thing to sprout (aside from that tenacious grass) in the patch where I planted them last winter was this curious looking plant with dark green leaves that looked sort of like a sunflower. So I figured I’d let it live. And it grew pretty big. It wasn’t too long before we saw it’s blossoms start — they resembled a morning glory, rather trumpet like. Definitely not the flowers I’d seen on photos of the jerusalem chokes. But it was lovely, and it seemed to be a bug trap (the insects loved this one) so we let it live on. Last week, M and I saw some crazy seeds emerge — I mean crazy, spiny green walnut-sized pods. It was time to identify the invader. Thanks to our friends at google, the search terms “weed white trumpet flower spiky seed” brought up oodles of images of our mystery weed. As it turns out, this one was a real doozie. Jimson Weed (Datura Stramonium), aka Devil’s Weed and Thorn Apple, is a toxic deliriant. The seeds can lay dormant in the soil for years and sprout when tilled up. The plant turns up in all kinds of native traditions in the Americas and North Africa, used by shamans and the like to induce strange states and all manner of mystical craziness. 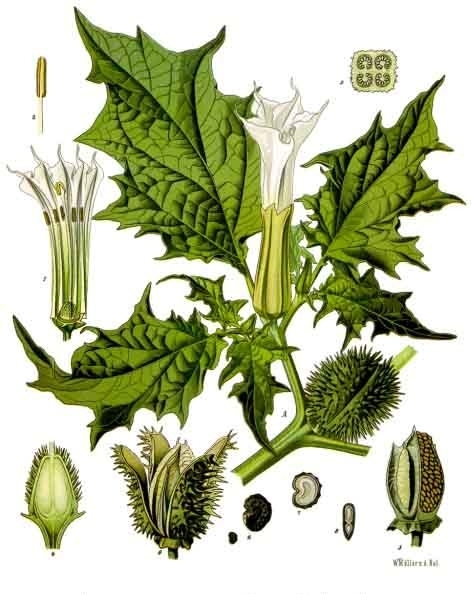 Possibly the most interesting anecdote, however, is the origin of the name Jimson Weed, a corruption of’Jamestown Weed’ . As the story goes, way back when, in the Jamestown Colony (just across the Chesapeake Bay from us) some British soldiers were drugged with the weed while trying to suppress Bacon’s Rebellion. For eleven days, the soldiers appeared to have gone insane and got up to all manner of shenanigans. Read an excerpt from the history on Wikipedia. Needless to say, I chopped it down today and threw it out in the woods to die. I don’t fancy finding out any more about this weed first hand. PS – none of our jerusalem artichokes ever sprouted. Bummer. I guess I’ll just have to plant more beets! Oh-oh. 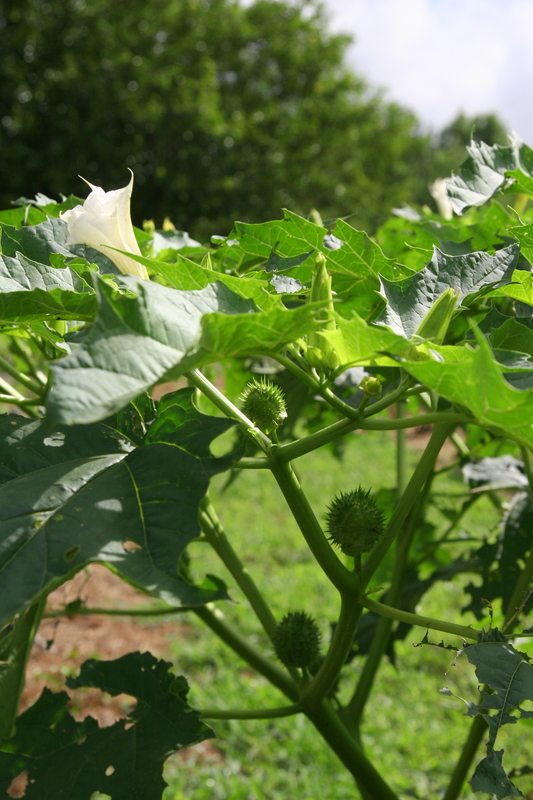 Jimson weed is very poisonous* to animals! So it is not so good that Gene Autry sings about cattle eating it, kind of like when Tom Lehrer coyly sings “I’m Poisoning Pigeons in the Park!” Nope, you don’t wanna eat that stuff. Luckily it supposedly smells, so only really hungry cattle have eaten it, poor critters! Painful death! Ch. the subj., we once tried to grow Jerusalem artichokes, too, only it was in our greenhouse. However we had no luck either. Don’t know if you need to cut and paste, but here are the experts. As I know you know, jimson weed is mentioned in the ol’ cowboy song, “Back in the Saddle Again.” It is mentioned as a grass for grazing cattle. Must’ve been happy cattle, huh?